Boy oh boy what an ice-fishing season it’s been across the Midwest, and it’s not done yet: There is still lots of time to go fishing and lots of fish are still out there waiting to be caught. This is the time of year though, when it pays to be flexible in your fishing. In some areas the season for keeping walleyes is over or winding down. And, some species have been fished pretty hard in some places, so the remaining fish can get finicky. This doesn’t mean we can’t catch’em, we can. Lot’s of them, and big ones as well. We just need to adjust a bit to continue to experience fishing success through the ice. One of the keys we might need to adjust is the species we’re after. For instance, if you are a walleye enthusiast, and if the lake you fish is in one of those areas where walleyes go off-limits, you’re going to need to adjust to another species. That’s not a bad thing. Many walleye lakes that you fish also have outstanding perch populations. Perch are fun to catch and they’re great on the table: Just as good as walleyes. This walleye took a liking to John Peterson’s Buck-Shot Rattle Spoon. To be successful with perch, you will need to size your bait down a bit and go to lighter line. P-Line Floroice in four pound test is very good: Easy to manage and nearly invisible, which is good for finicky perch. Also scale down your lure size for perch. When they’re aggressive an eighth ounce Buck-Shot Rattle Spoon will catch’em good, but when they get a bit funky, a bait in the sixteenth ounce size will almost always get a few to bite. If you see fish come in and look at your bait but not eat it, try holding it as still as possible. That will also usually turn lookers into eaters. Get away from the crowds. 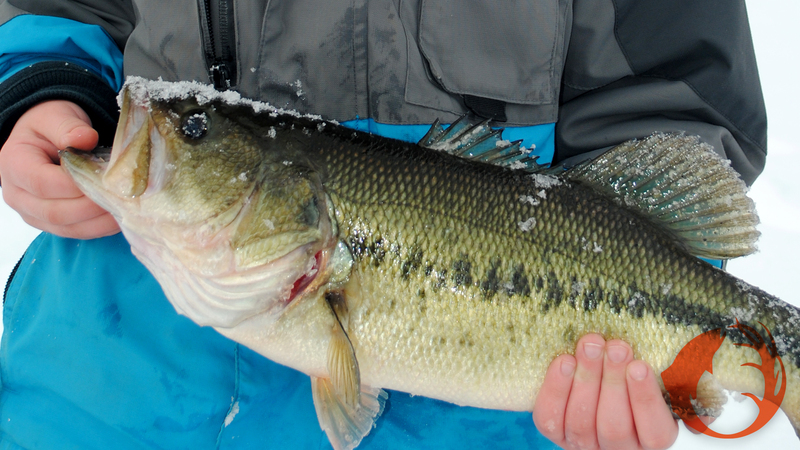 Abandon the spots that everyone knows about and see if you can find some fish that haven’t been pressured all winter. Sometimes it works to just drill a bunch of holes out in the basin of the lake and move from hole to hole. In this case you’re not fishing a particular structure or spot, you’re just looking for a school of fish that are moving from one area to another. If you know of a landowner that has a pond on their land, and if that pond has fish in it, see if you can get permission to fish. Many ponds get minimal pressure, and sometimes the pond-owners would like to see a few fish taken out. You can catch crappies, bluegills, bass, and more often than you might think, catfish in these small but productive bodies of water. Last of all, you might want to get after the exotics. In some parts of ice-country, whitefish are a popular quarry from under the ice. In other places, eelpot, also known as burbot or freshwater cod are caught regularly. Whitefish and ‘pout are both willing biters, strong fighters, and when prepared properly, very good table fare. I’ve caught both species, more ‘pout but still quite a few whitefish, and it’s just a good time, and that’s why I go fishing.